Horses love Equine Hanna Somatics… and they love remembering how good it feels to move in harmony. 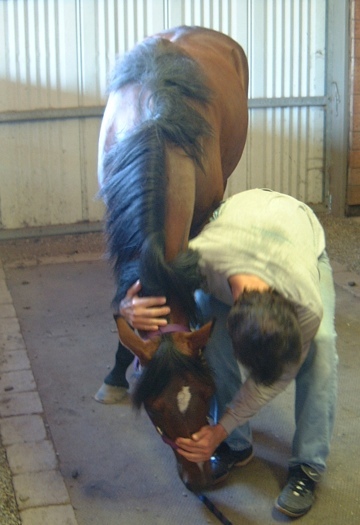 While Hanna Somatic Education is for humans, horses can receive bodywork. This works with the very natural process that all healthy vertebrate animals engage in. Yet this very process can be arrested. With a gentle reminder, horses begin to remember and move with greater ease, lightness, and the liveliness they once had. Movement is like software and if we aren’t updating our movement software… it’s like a computer which has bugs… and yes our four-legged friends can get some bugs during training and accidents. When reminded of their natural tendency to self-correct, harmony is restored. EHS can help relax the neuromuscular system, increase the range of motion, and decrease the likelihood of injuries. EHS helps roll back the clock in the aging process. EHS fosters trust and relaxation to help healing. If the environment is not appropriate. The horse has a wound or acute injury. The horse is sick, i.e. has a fever. There are fractures or possible fractures. Just like working with people, horses love somatics. The wonderful outcomes a sentient being receives are amazing, if not seemingly miraculous, yet, the very process of animal pandiculation are now evident. See this PANDICULATION LINK and learn what is observed in healthy animals. Equine Hanna Somatics® is very similar to Hanna Somatic Education® other than the application for the fellow equine. Your horse will be guided through a series of gentle movement patterns so the brain can change how muscles respond. The release out contracted and movement-forgotten states relaxes your horse relaxes and will be much easier to ride or work with. Typically a session lasts about an hour. From E.C. Hanna, “Like humans, horses experience stress and develop chronically contracted muscles. Equine Hanna Somatics® is a hands-on procedure for teaching horses, horse riders, and horse handlers the voluntary conscious control of the neuromuscular systems of horses suffering muscular disorders of an involuntary, unconscious nature. 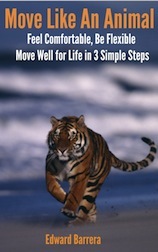 Better Yet, Try the 3 Step Method for Yourself so You Too Can Feel What It’s Like to Move Like a Comfortable Animal. Press Here to Get it Now.